Call it chance or destiny, the plant world is a better place with Mini Man™ viburnum. This round, compact flowering descendent of the twelve foot Manchurian Vvburnum (V. burejaecticum) was accidentally discovered by Ft. Collins Wholesale Nursery propagator Scott Skogerboe in 1999. With an invitation to visit a nursery in Montana, he spotted just one exact, but smaller version of a V. burejaecticum shrub growing in a fifty-foot hedgerow of tall Manchurians at Valley Nursery in Helena. That’s a long way from its native land of northern China and Russia! Over sixty years ago early horticulturists from the United States Department of Agriculture traveled to regions of the world with growing conditions similar to our area in search of plants that might grow equally as well here. So, Manchurian viburnums made their way to the United States via Canada and then on to the Cheyenne Horticultural Field Station. They grew at the Cheyenne Station for many years, but only a small handful of nurserymen took seeds and cuttings from V. burejaecticum to propagate, distribute and sell, one being Clayton Berg in Helena. Fortunately for gardeners, with Scott’s keen eye a single Manchurian seedling matured to the delightful, low-maintenance dense form that is called Mini Man™ dwarf viburnum, and a 2016 Plant Select® selection. 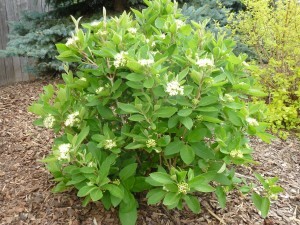 Mini Man™ produces pretty creamy-white flower clusters that bloom for several weeks each spring. Red changing to blue-black berries follow the flowers which complement the medium-green, textured leaves which often turn maroon in the fall. It’s no accident that Mini Man™ is perfect for smaller gardens, around patio spaces or even as seasonal container plants. Plant Mini Man™ in roomier gardens, as foundation plantings or mixed throughout the perennial border. Mini Man™ is deer resistant, cold hardy and will maintain its neat and round growth form until it reaches four to six feet tall and wide. Ms. Cahill: I have been unable to locate this shrub. Any suggestions on who may carry it?